Bottle feed your little one with ease with the BPA free & anti-colic NUK Nature Sense 150ml Bottle. 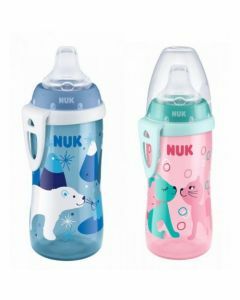 The NUK Nature Sense 150ml Bottle has been specially designed to replicate the milk ducts in a mother’s breast to make the transition to bottle feeding as easy as possible for your little one. The soft silicone teat on this bottle features several tiny holes to ensure a steady & natural flow of formula is being released during feeding.